A lack of painting time over the past couple of weeks means that I don't have a finished painted unit of the new Perry plastic AWI figures, but I thought I'd post some initial impressions now that I've finished painted 4 and have assembled a complete unit of 12. Each box provides 30 hatmen, 2 NCOs, 1 drummer, 1 officer, 2 ensigns and 2 casualties. Luckily the Perries are making the command sprue available separately, as this box provides about 2 battalions' worth of infantry at a 1:20 ratio. The ensigns don't have gorgets, but otherwise are similar figures to the officer - i.e. no lace and no epaulettes; you could perhaps mix and match. 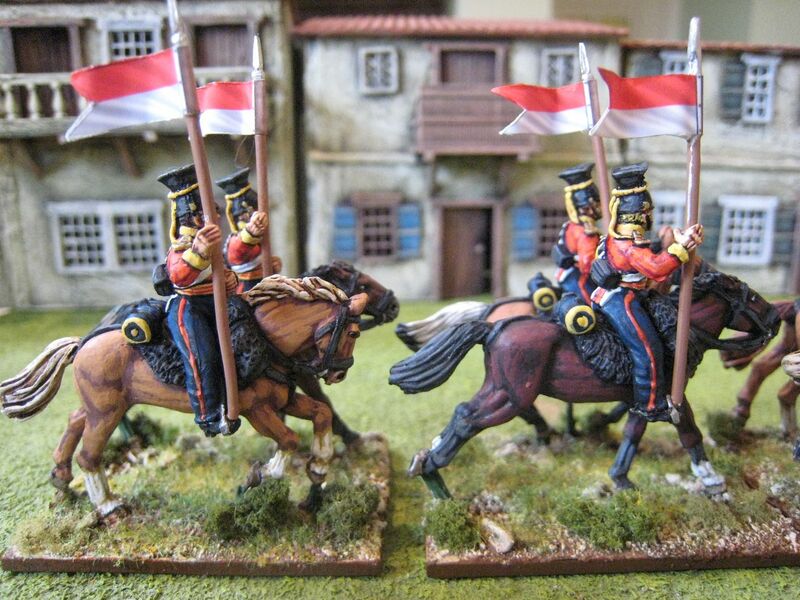 The ensigns don't have to carry the flags, as there are sufficient spare arms to give them swords or muskets. The key feature of this set for a collecting perspective is the different hats - tricornes, "Saratoga" hats and cut-down/uncocked hats. This makes the figures usable across various campaigns and I very much hope that future AWI plastic sets will continue this theme, as that will increase the variety. So, the positives: superb detailing and "casting" (I don't know what the equivalent plastic word is! 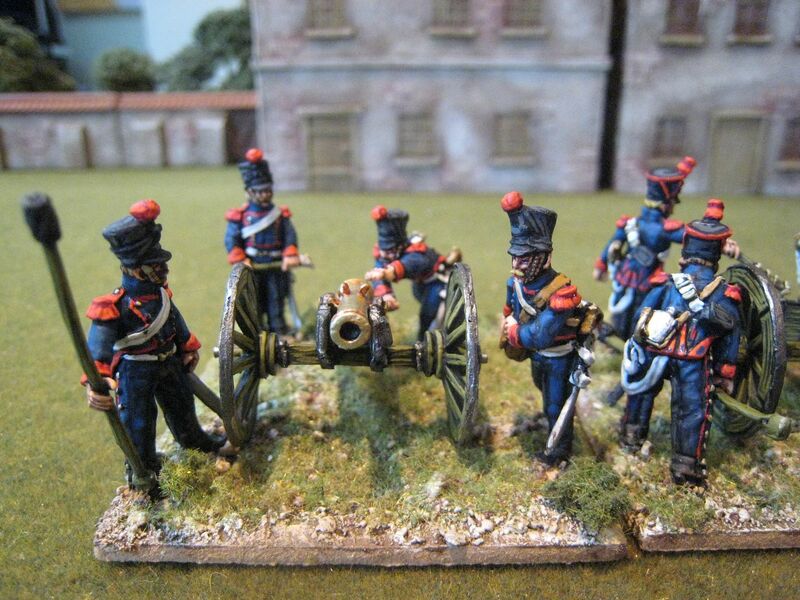 ); hardly any mould lines; excellent "Perry" faces; the variety offered by the command figures; ease of painting. I also like the trail-arms pose (there is a "charging" option too). This is a new pose in the Perry range and seems an apt one for troops moving quickly through rough and wooded terrain. I've seen comments from some people who don't like it, but I do. Marching and firing figures are already available in metal. Another new feature on these figures are the "tumplines", i.e. rolled blankets in which the troops stored personal items. These were slung across the back, but the figures are sculpted such that you can leave the tumplines off - all the other necessary straps are sculpted on to the back of the figures. Finally, these figures are in the one-piece "gaiter-trowsers" (or "overalls" as the Americans called them), which again help on flexibility of use. The second issue I've had is that the different hats are very delicate and if you're not ultra careful it's easy to cut chunks out of them when you remove them from the sprue. The hardest ones to cut off are the un-cocked hats (i.e. the hats I'll use most frequently), as they are joined to the sprue by a triangle-shaped bit of plastic that needs to be carefully carved out of the hat. Again, hopefully this will get easier in time, but it's going to be important to keep some of the leftover hats as spares, I think. But those two points aside, I have no complaints whatever with the figures and the figures receive a hearty recommendation from Tarleton's Quarter. The painting guide is right up there with the Napoleonic French hussars box's guide as a model of its kind (almost worth the price of the box in itself). I had no idea that the troops' overalls came in different colours (white for summer, dark blue, brown or black for winter), and there is a helpful section on loyalist units that are thought to have worn lace on their coats, and so can be modelled with these figures (although, ironically, it seems that the officers of loyalist units often had lace, even if the hatmen didn't; so the command figures here need lace painted on). And talking of painting, these paint up like a dream. They are certainly easier to paint than the metal equivalents. 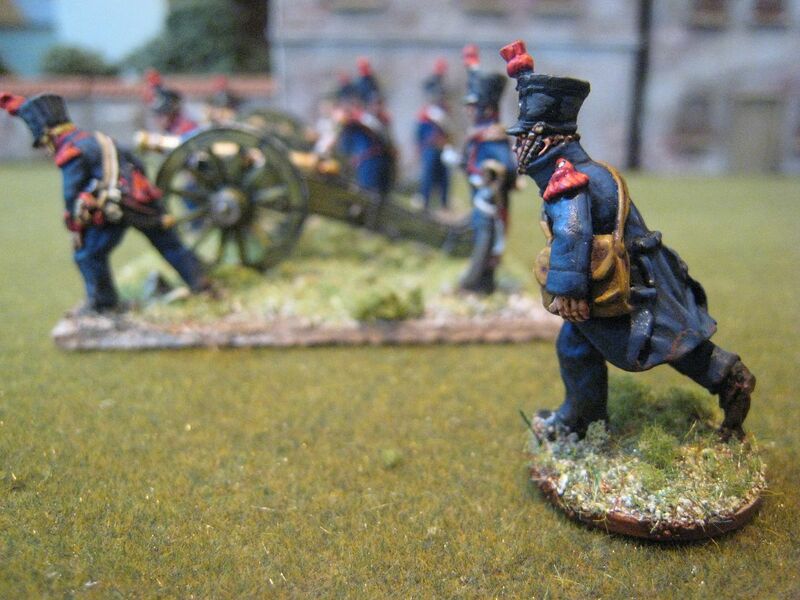 So they officially join the Perry plastic Napoleonic French infantry as being "figures that almost paint themselves". 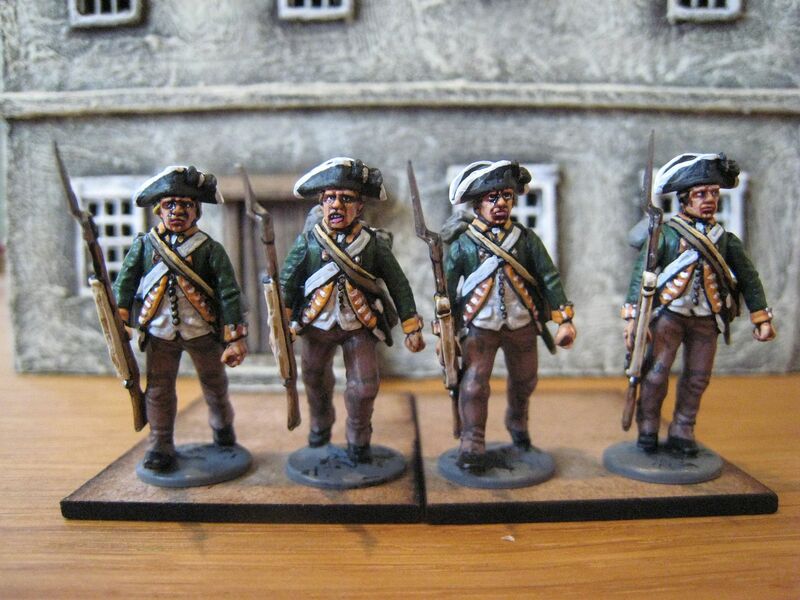 - Loyal American Regiment: 16 figures - green 1777 uniform. And the figures in the photos? They are the King's Orange Rangers in green coats for the 1777 Hudson Forts scenario (in the third volume of AWI scenarios published by Caliver Books). 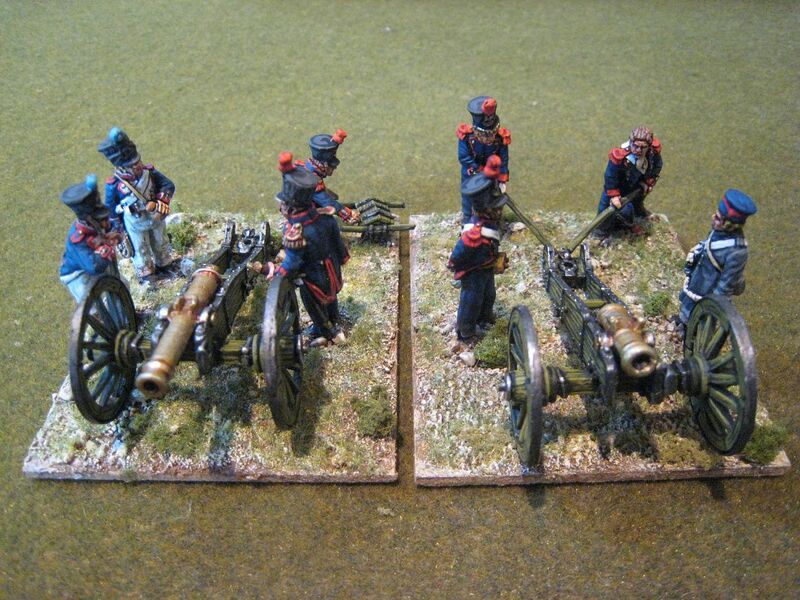 Here are the two Perry French Napoleonic horse artillery packs which, together with the Foundry pack I painted last October gives me one complete battery. According to Adkin, each French cavalry division at Waterloo had a horse artillery battery of four 6-pounders and two 5.5 inch howitzers. 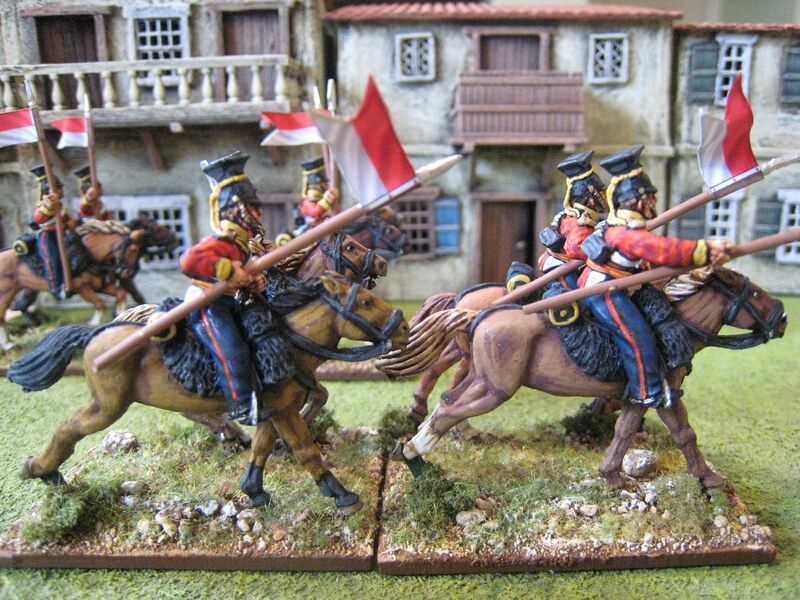 I haven't really started on any cavalry from my French army as yet, with only one cuirassier regiment painted. I suppose what puts me off rather is the length of time I know it will take - those cuirassiers took the best part of a month, I recall, and that was at a time when I had much more time than I do now. There's not much more to say about these figures. 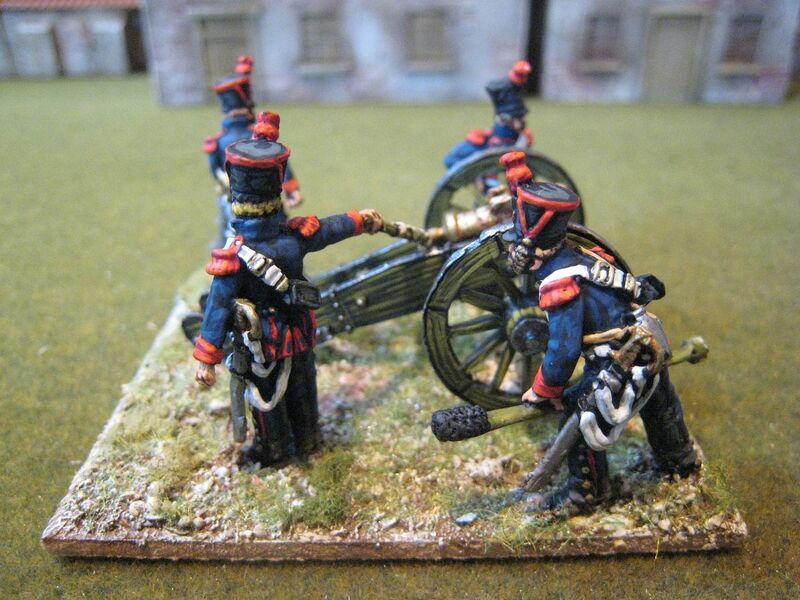 I have a few more Napoleonic things to post about but tomorrow I'll have some AWI. If I can drag myself away from eating chocolate this afternoon I'll post a review of the new Perry plastic AWI British infantry. 8 figures. Painted January 2013. 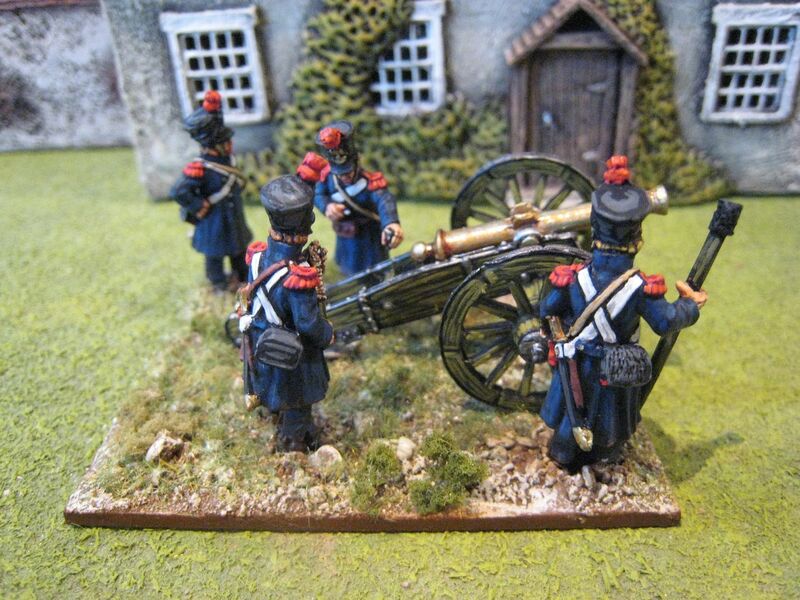 This is the last French line artillery 6-pounder crew I painted recently, the Perry pack in greatcoats. The Perry French range now gives you artillery crews in service dress, shirt-sleeve campaign dress and greatcoats. I wonder the extent to which all 3 "uniforms" were worn in the same battery. Anyway, these are nice figures, very easy to paint. 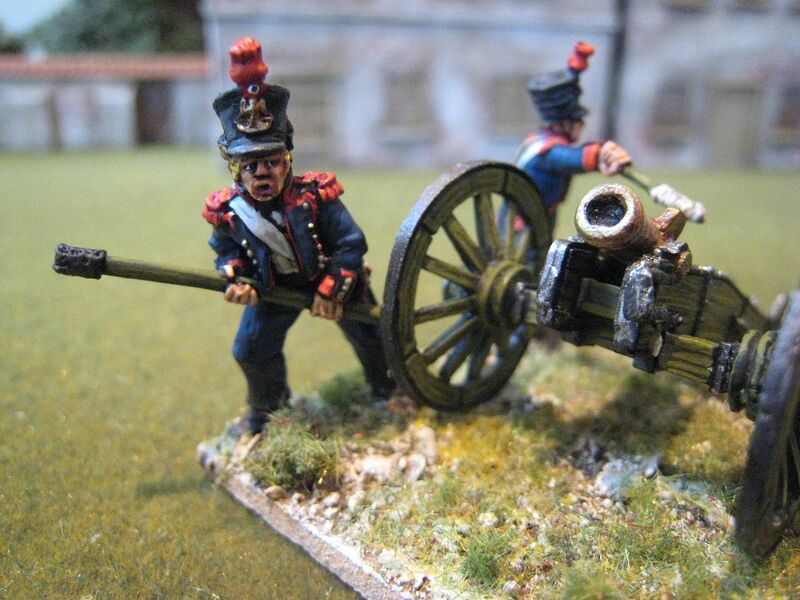 To recap on the greatcoat colours: for French Napoloenic light infantry and artillerymen, i.e. those who wear dark blue coats and trousers, I use the Foundry palette "French Blue 65" with a final highlight of Foundry "Deep Blue 25B". 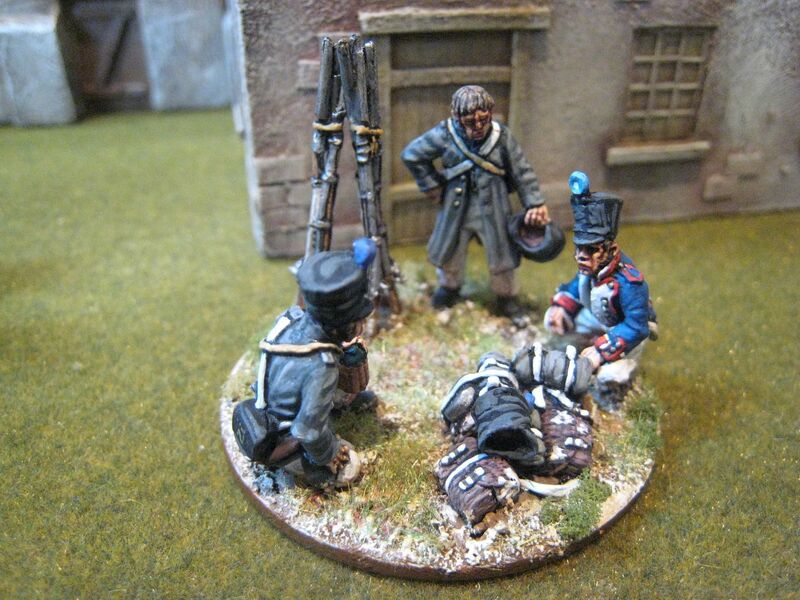 I still have several more Napoleonic units to blog about, but I've called time on painting Naps and am returning to the AWI. 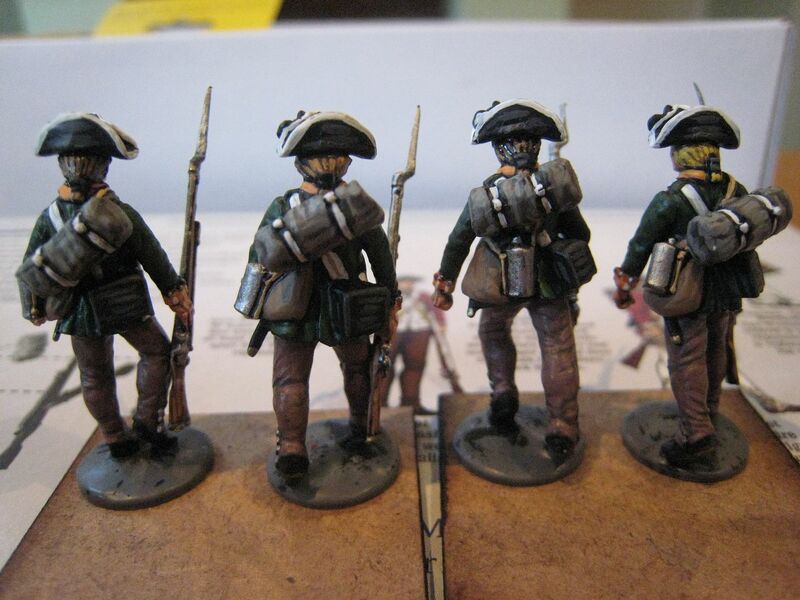 I had hoped to be able to post about the new Perry plastic AWI British infantry, but unfortunately I've been beasted at work recently and haven't had much time to paint the 4 trial figures I've assembled. I should have 4 trial figures finished in a few days and will reserve written judgment until then. 4 figures. Painted January 2013. 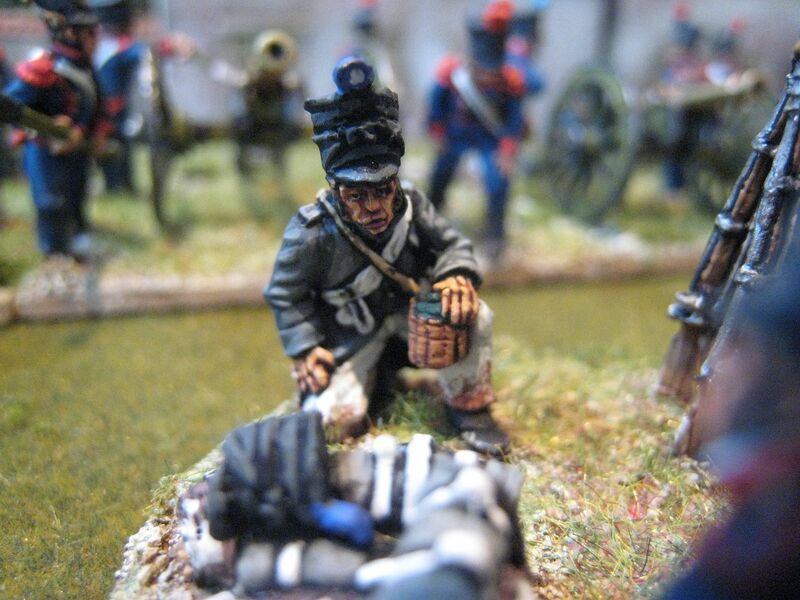 This is just a short post on a little vignette that uses up the balance of the Perry "infantry hired help" figures. I could have based these figures singly but I thought putting them together on a small stand with their muskets and packs would look better, and of course can be used outside of the "artillery zone". 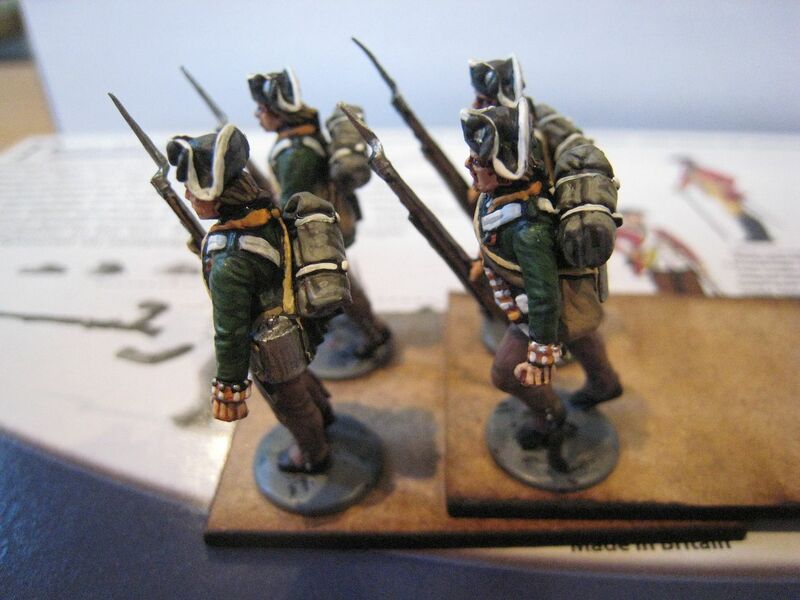 The greatcoats are painted using the Foundry "Stone" palette, which is the colour I'm using for all my French Napoleonic line infantry greatcoats at the moment. When I painted these and the other infantry figures that went on the artillery crew stands I painted the shako pompons in 2 different company colours, as I thought it would be unlikely for an entire company to be on artillery duty at one time (at 1:20 the 6 figures in the pack would represent an entire at-strength company). 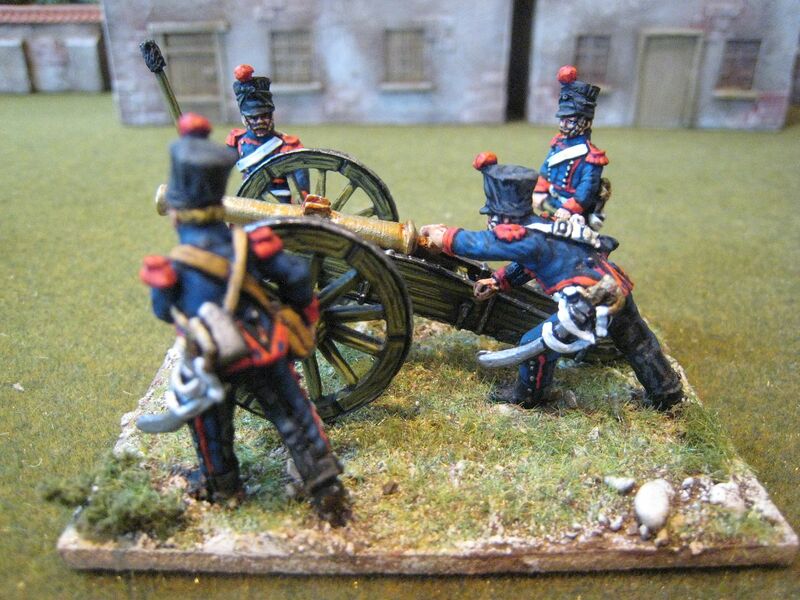 I suppose if you added some epaulettes to these figures they would make quite nice extra artillerymen. Two further things to say while I'm here. First, I'm having Blogger problems again, in that I've noticed a lot of comments I've posted on other people's blogs aren't there. Either the blog owners are not allowing them through (unlikely) or something goes wrong when I submit them. It mainly seems to happen on blogs where you have to do that ghastly "captcha" word verification thing. 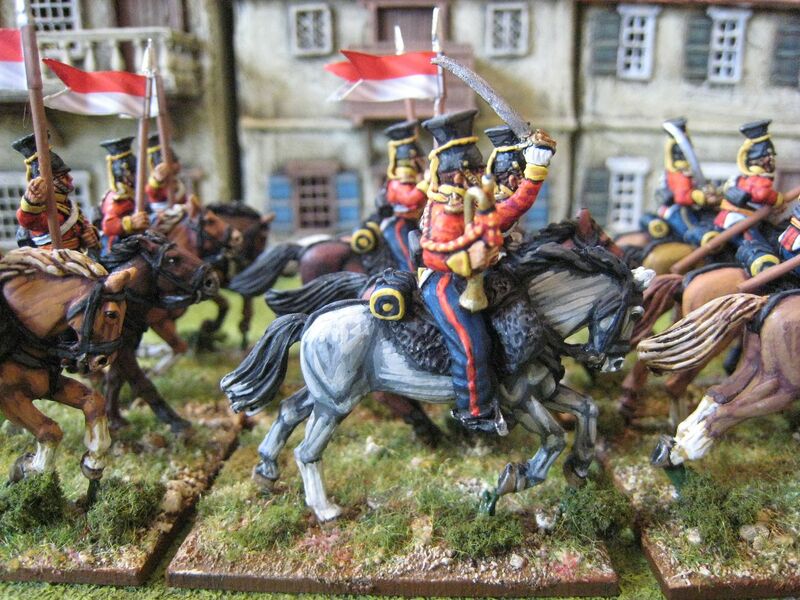 Secondly, while I have 8 posts' worth of finished Napoleonics to write about over the next couple of months, I'm going to spend much of the next few months on the AWI. 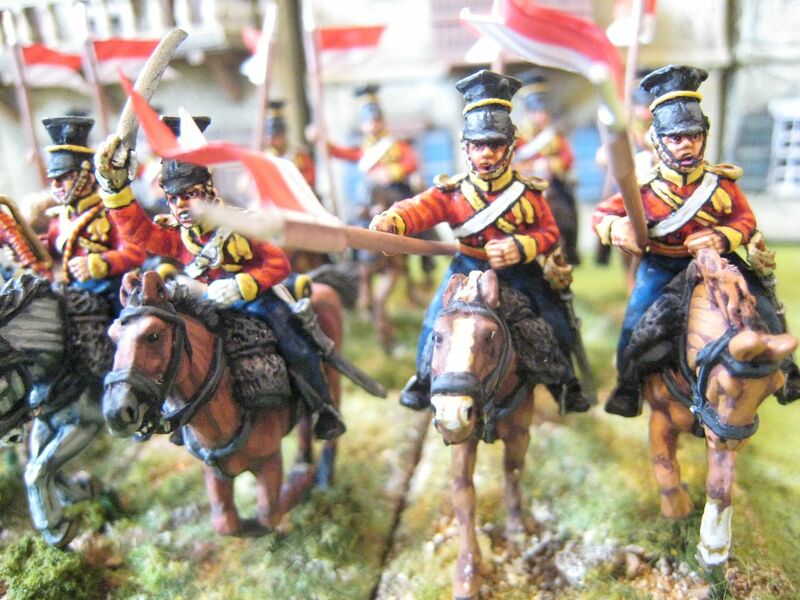 I'm waiting for my boxes of Perry plastic British infantry to arrive and I'm also re-visiting Eureka's cavalry figures. Some cryptic statements on TMP also suggest that we'll see plenty more Perry AWI releases in due course (the last metal pack was AW175 and the plastic British are AW200, so I assume there are at least another 25 packs to come!). Finally, I'm making progress with Bill Nevin's excellent King's Mountain highlander figures and when the first unit is finished I'll post some pics before I send them off to Bill in the USA. I don't take on painting commissions (there's not enough time to paint everything I want for myself! ), but Bill made me an offer I couldn't refuse and he's getting 50-odd painted highlanders in return! 3 figures. Painted December 2012. 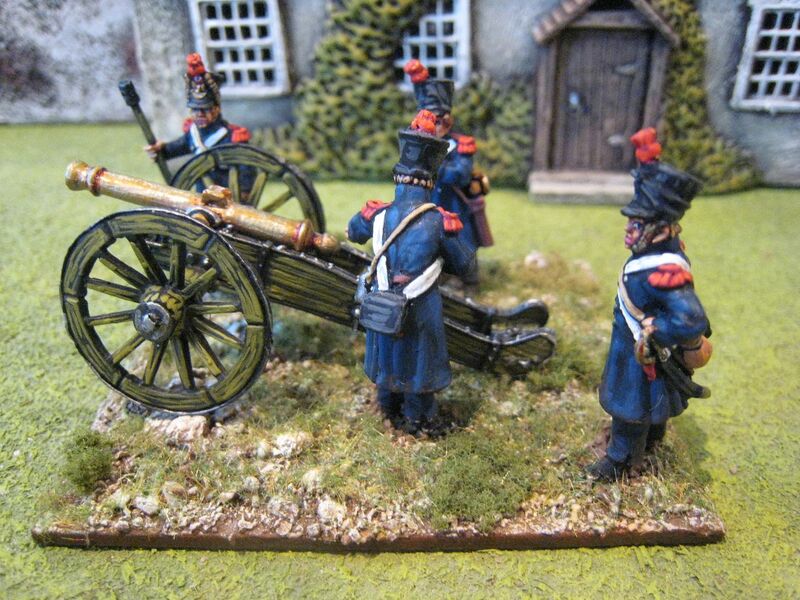 Here are 2 further artillery pieces and crews that I put together with the additional figures contained in the Perry Miniatures packs, FN20 "infantry hired help" and FN21 "extra artillery crew". I like mixing up the figures supplied in artillery packs, so long as the end result matches some kind of realistic activity. 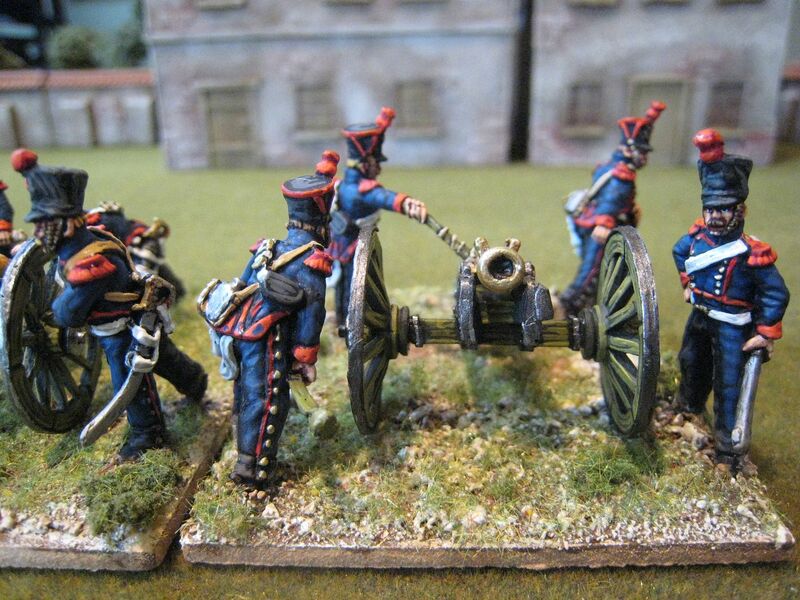 When putting all the French Napoleonic artillery crews together I looked at a number of books for details on exactly who stood where and for what purpose. Adkin's "The Waterloo Companion" has some good info on all this and also of use were the old Osprey "Napoleonic Artillery" MAA and the Almark "Nations in Arms" book on Napoleon's Artillery by Paddy Griffith. (Did Almark ever release any other titles in the "Nations in Arms" series? I've only ever seen one other book on British cavalry.) Painting all these Perry packs coincided with the release of the Befreiungskriege limited edition artillery-ish pack (which I painted the other week while on paternity leave) and some artillery-related goodies from Westfalia Miniatures which I am hoping to paint up soon. Anyway, about these 2 pieces. 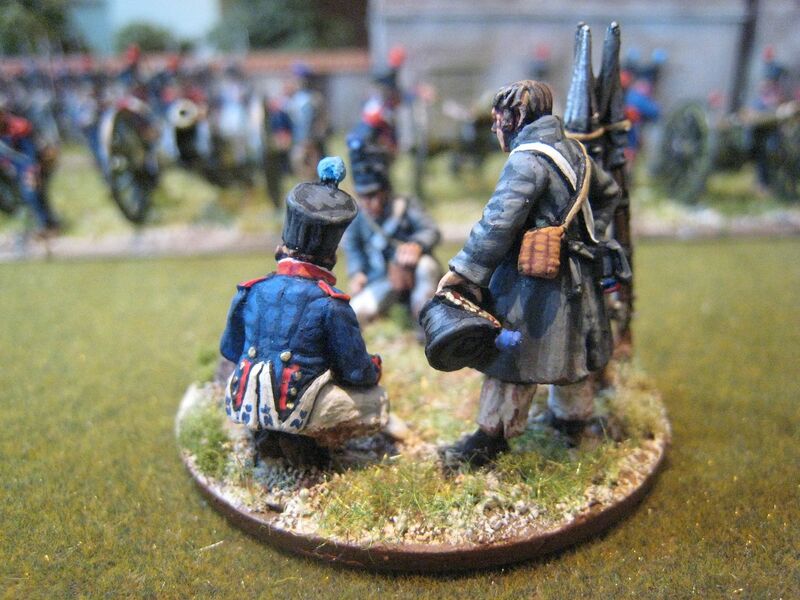 The story with the first is that the trained crew has largely been lost due to counter-battery fire (I'm ignoring Wellington's orders at Waterloo against this) and a wounded officer is explaining to two infantrymen "hired help" what needs to be done. In the meantime, the remaining artilleryman examines the ammunition situation. I gather than while the ammunition wagons were situated behind the batteries, each gun's little ammunition box (not sure about the correct phrase) was kept quite close. 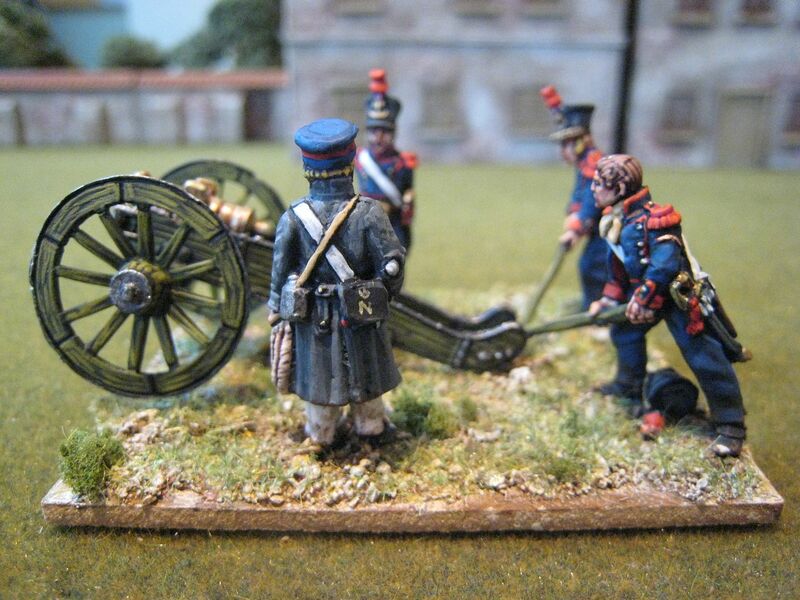 In the second set, 2 artillerymen with trailspikes are positioning the gun while another gunner gives some orders to an infantryman helper carrying some drag-rope. Asn I mentioned in my previous post, making up extra crews like this is good fun but you then need extra guns to go with them. 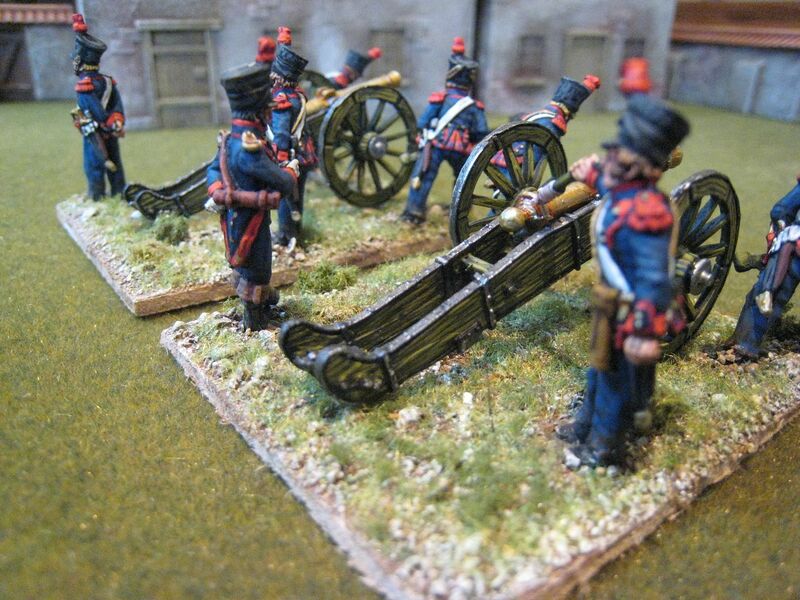 Perry Miniatures seem to have a policy of not selling artillery guns separately, so the options are either to buy them elsewhere (for example mega-expensive Foundry or Front Rank) or buy some of the Perry limber packs that come with guns. 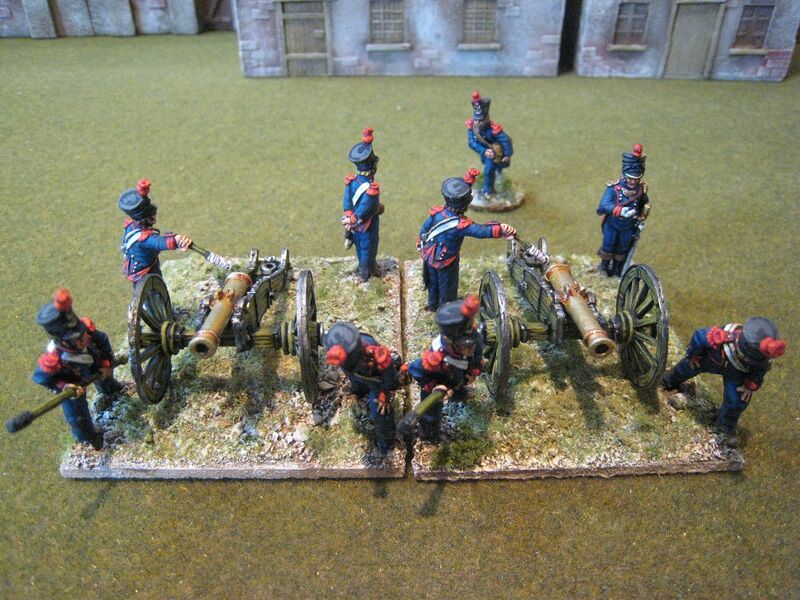 It is an easy decision really, so I bought one Perry French 6-pounder foot artillery limber set, but I'm a still one gun down; I'll probably just wait a while and then buy some other limber packs. 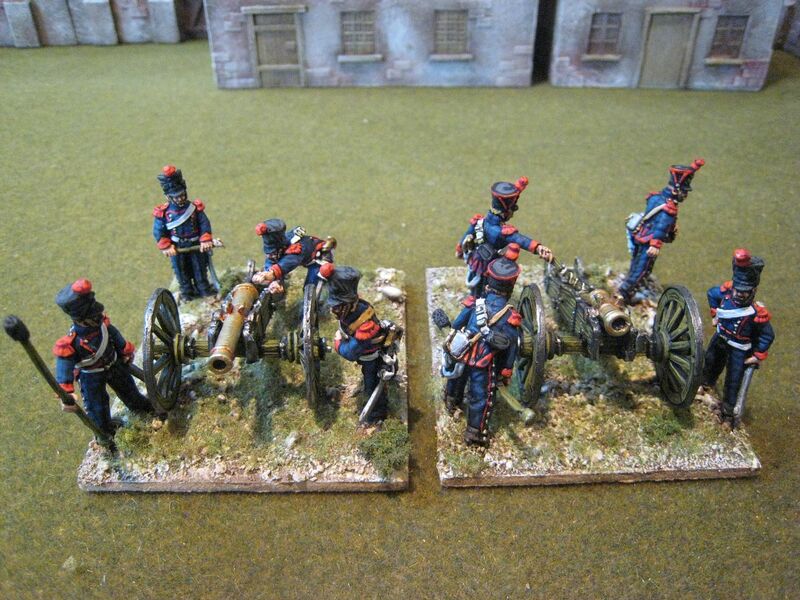 A couple of readers asked about the buildings in the background of this sequence of Napoleonic artillery posts. They are from Tablescape, from whom I've been buying a variety of stuff over the years. As well as making buildings to order (like my AWI Ring House and Harvard Church) they do a lovely range of ready-to-go Mediterranean buildings that can be used for several different theatres and periods. 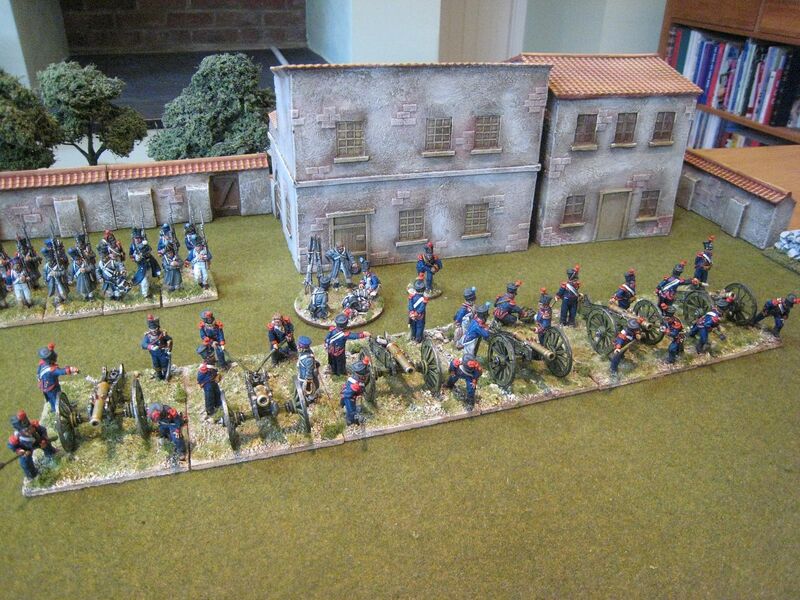 These buildings are very light and nicely painted, and blend in well with my other Touching History Spanish-style terrain. 8 figures and 2 guns. Painted January 2013. 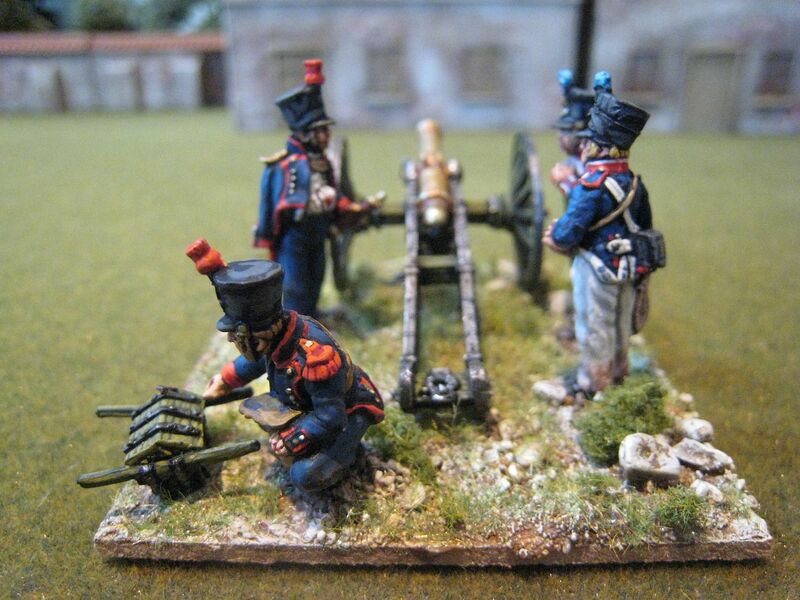 In December and January I painted up a load of Perry Miniatures gun crews. I'd had these figures for a while (many being a kind present from NZ wargaming chum "Captain Chook" of the WD3 forum) and had delayed painting them for ages while I agonised over what paints to use for "French artillery green". After an initial disappointing result with the "authentic" Foundry set, I eventually found a Vallejo combination that I'm reasonably happy with. To recap: for the base coat I used "Yellow Green" mixed with plain black; then first highlight of neat "Yellow Green" and second highlight of "Yellow Green mixed equally with "Dark Yellow". The metalwork should proabbly be a bit more "black", but in real life it doesn't look quite as bright silver as you see in the photos. 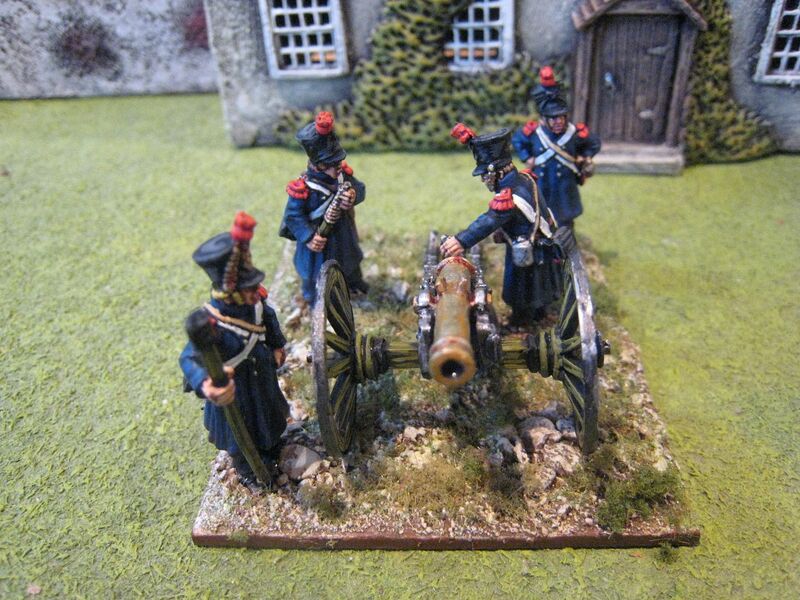 Artillery was the main thing missing from my French Napoleonic collection and I'm pleased to have painted all these up at last. 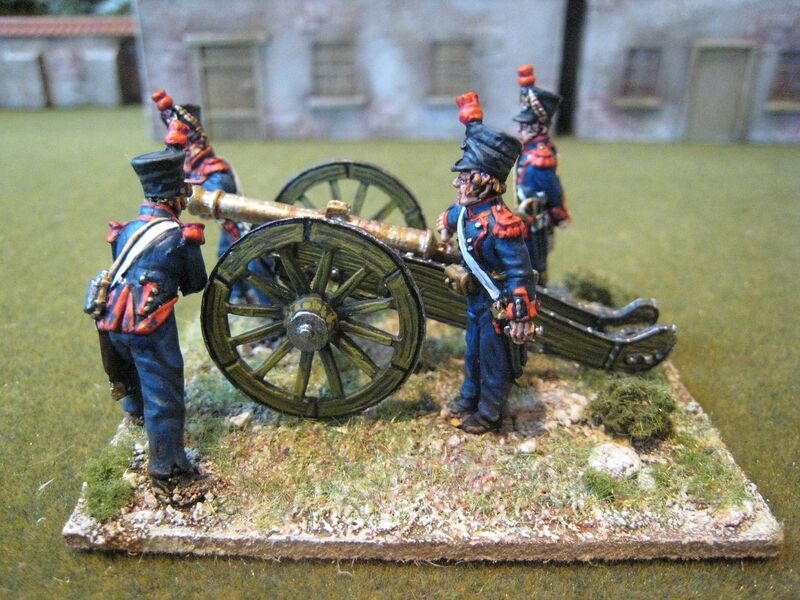 Whilst painting the guns themselves can be a bit exhausting (there's a lot of mixing of those Vallejo paints), I had forgotten how quick artillery crew are to paint and Napoleonic artillery always looks good en masse. 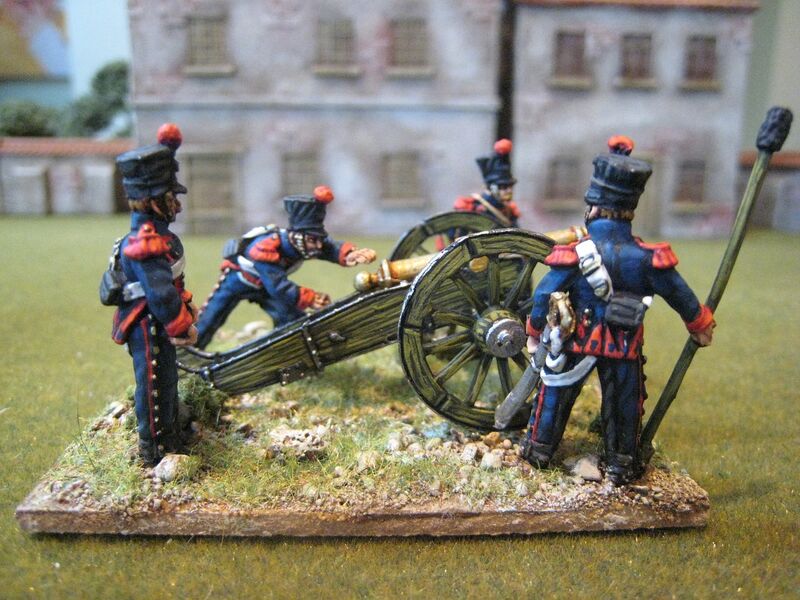 The General de Brigade orbat for Waterloo that I am using requires two batteries for each infantry division: 1 battery of four 12-pounders, and another containing three 6-pounders and one howitzer. 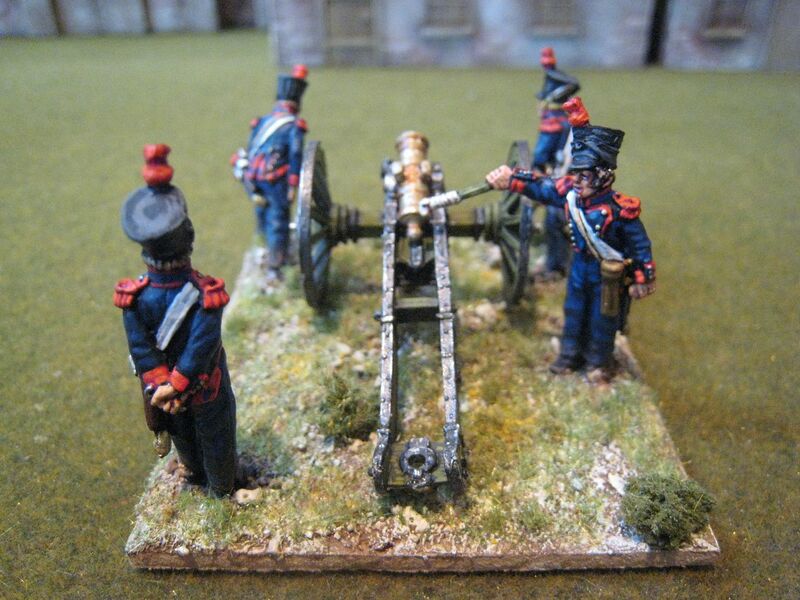 The 12-pounders are a bit of a concern, as Perry Miniatures only make one foot artillery 12-pounder set (with 6 crew figures; I've painted this set and the basing has caused a couple of headaches - more on that later). So I'll probably need to buy more of the 6-pounder and howitzer packs and move the crews around a bit. 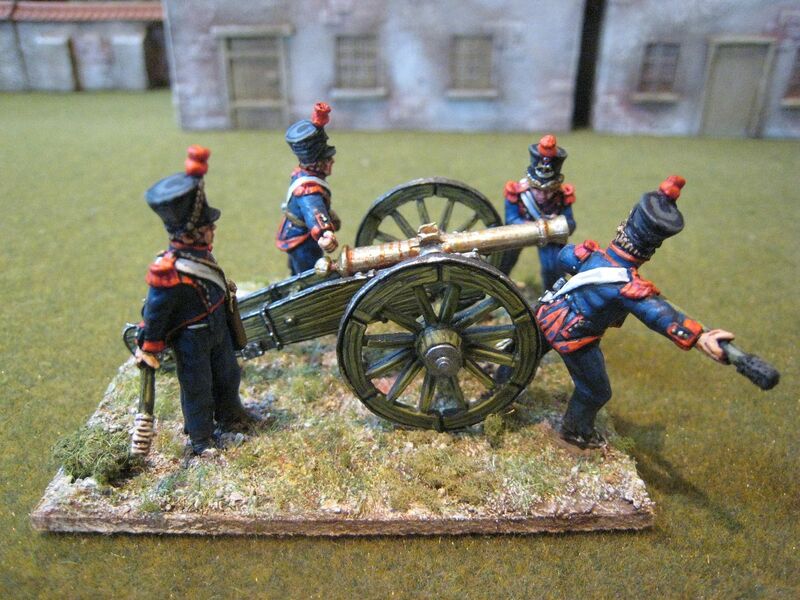 However, building the smaller calibre batteries is not a problem as Perry Miniatures provide a large number of foot artillery packs with 6-pounder and howitzer models. 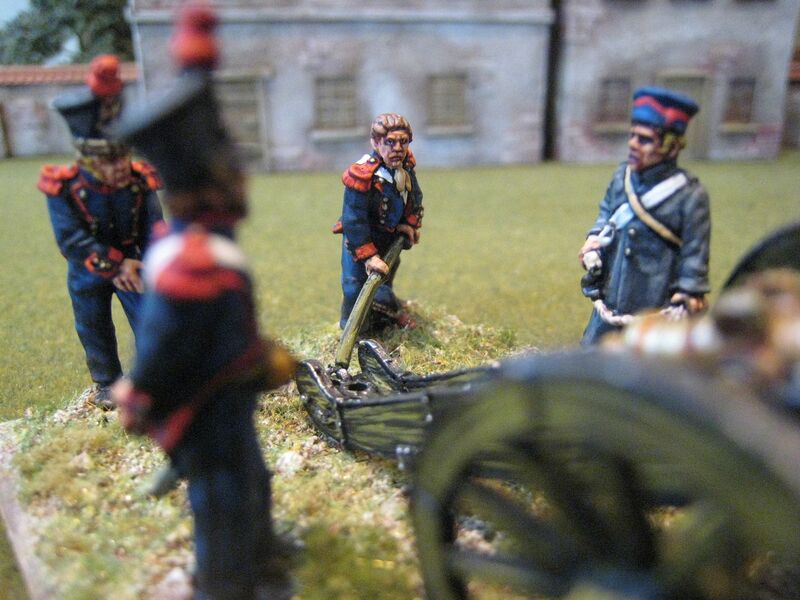 I have also used figures from the two "additional crew" sets (one of which contains infantry hired help) to create two further artillery bases. 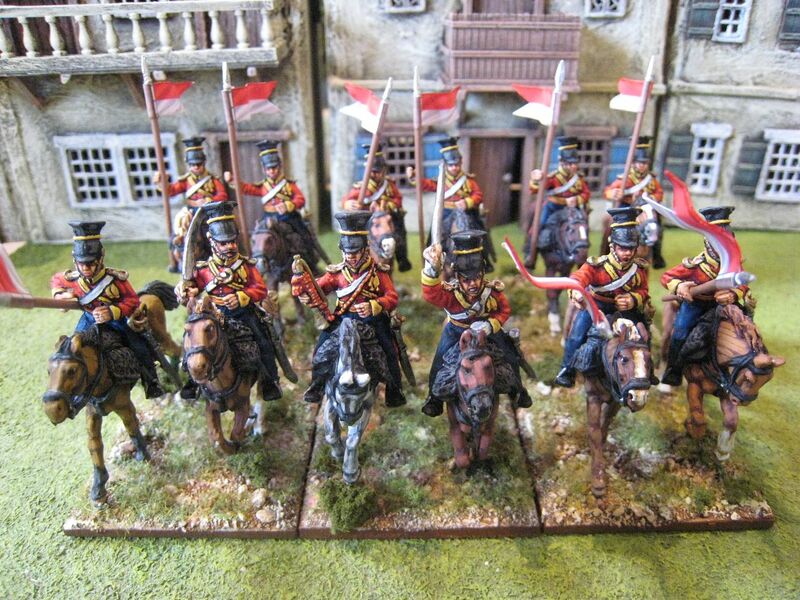 Those of course require guns, so I'll need 2 of the limber packs to have the extra guns (actually I have one already painted, but can't quite work out how to attach the limber to the horses....). 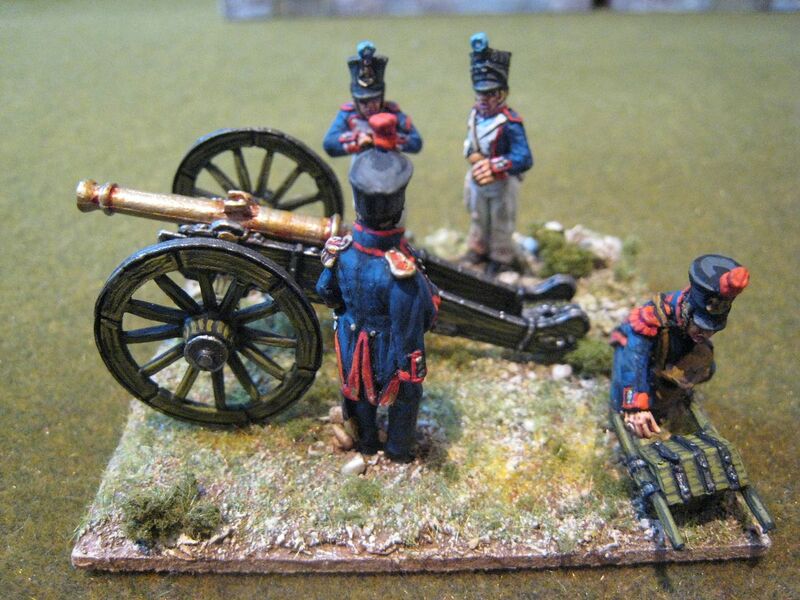 One thing I made sure I got right, having made a mistake when I painted a Foundry foot artillery crew a couple of years ago, was to position the gunner with the portfire to the right of the guns - this positioning was the opposite to how British Napoleonic gun crews stood. In the firing packs this seems a little odd, because the gunner is looking backwards, but it is accurate. 17 figures and 4 guns. Painted December 2012. The British Auxiliary Legion raised 2 regiments of lancer cavalry. The first regiment, named "Queen Isabella" recruited in the south of England, having its headquarters at Kingston-upon-Thames in Middlesex. Apparently many Poles and Germans joined, who proved to be excellent horsemen. The second regiment, called the "Queen's Own Irish Lancers" recruited mainly in Cork, Ireland. The northern provinces of Spain where the BAL was engaged was not really good cavalry country, and the two lancer regiments do not appear to have had many opportunities for classic charges. In fact, it seems that it took some time after their arrival in Spain in July 1836 for the two regiments to be fully mounted. On instance of a decent cavalry action is described by Brett in his "The British Auxiliary Legion in the First Carlist War". On 1 October the Carlists attached the BAL's lines at San Sebastian, which the Carlists had been besieging for some time. The Carlist attack began with an artillery bombardment that was particularly accurate as it was being directed by a BAL deserter who had served in the Royal Artillery. 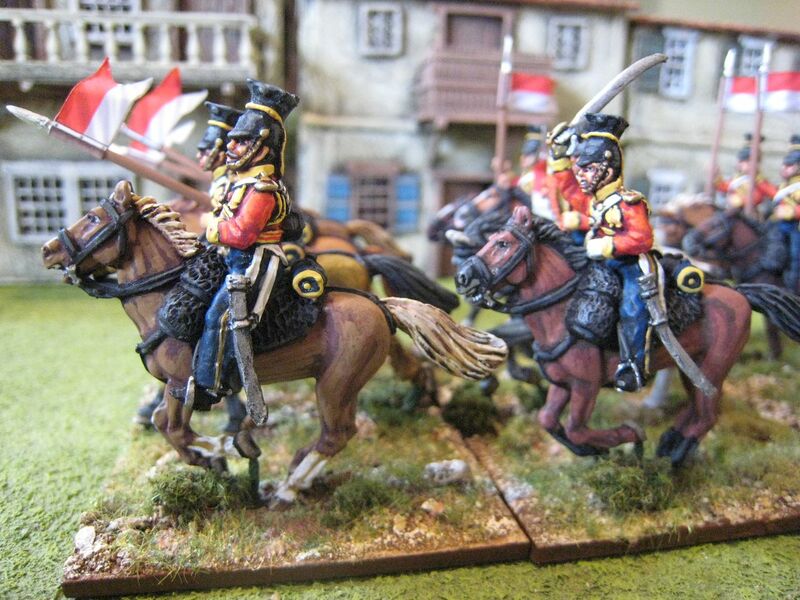 Once the BAL's own guns had conducted some effective counter-battery fire (which managed to kill the BAL deserter in charge of the Carlist guns), the 1st Lancers were ordered to charge the Carlists who were attacking the flank of the BAL's position. The charge made the Carlists retreat, but they then took position behind their own breastworks, which the cavalry were unable to attack. 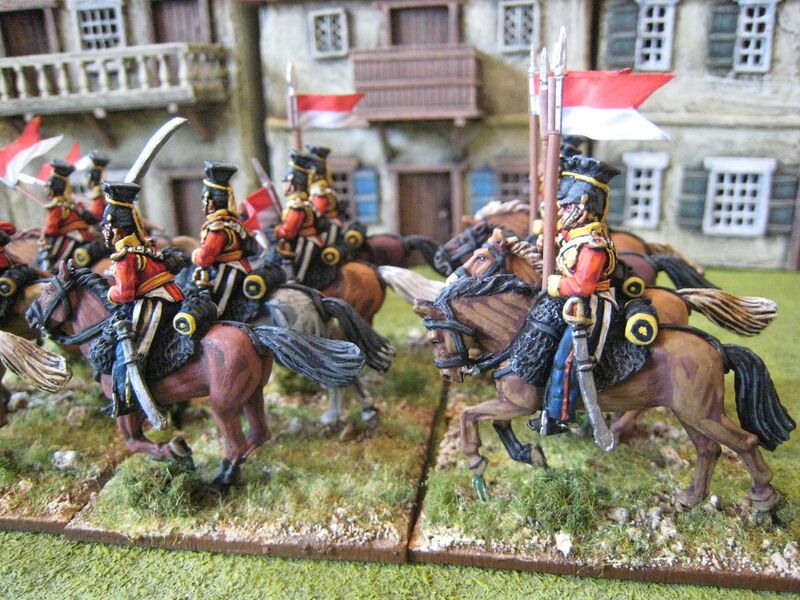 The lancers in turn then took heavy casualties from the Carlist guns . The limitations on cavalry were noted by the journalists attached to the BAL. The correspondent of the Cork Evening Standard wrote the following day that "cavalry are of no use in this country." 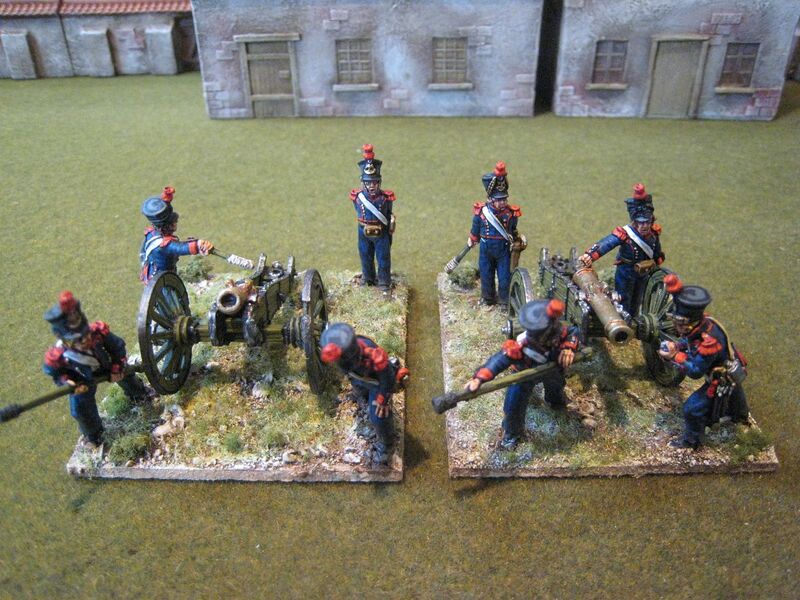 These figures are from the Perry First Carlist War range. Save for the absence of csapska covers, I expect these figures could also be used for the Sikh Wars and perhaps a few other things. The lance pennants are from Adolfo Ramos. 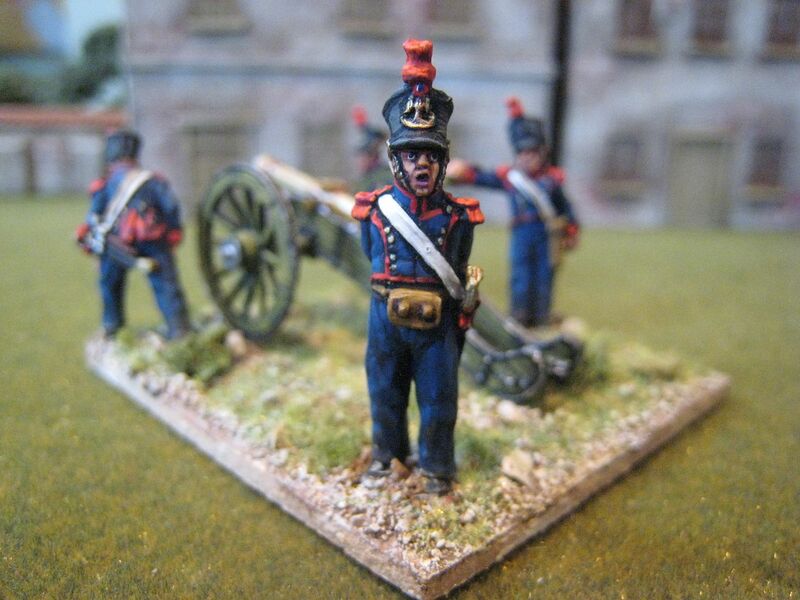 These are the last Carlist War figures I'll be painting for a while. 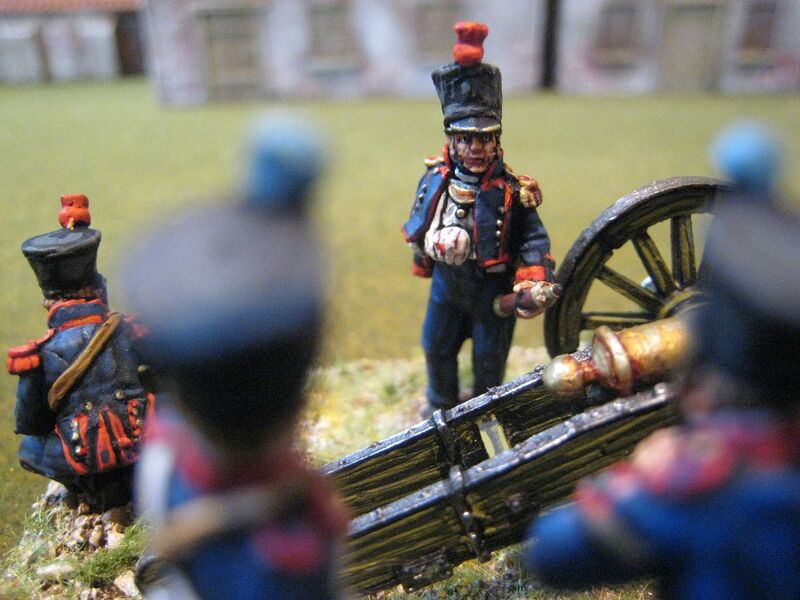 I'll be concentrating on the AWI and 1815 for the next few months. 12 figures. Painted September/October 2012.